The keyboard 'key' hotkey background has been updated to increase legibility. Playground is a low-pressure environment where friends can let their creativity run wild, build massive structures, practice with weapons and items, and fight against your friends. Have fun! Fill/No Fill option added to game mode selector. Chest & floor loot changed back to one weapon spawn each in order to cut down on clutter. 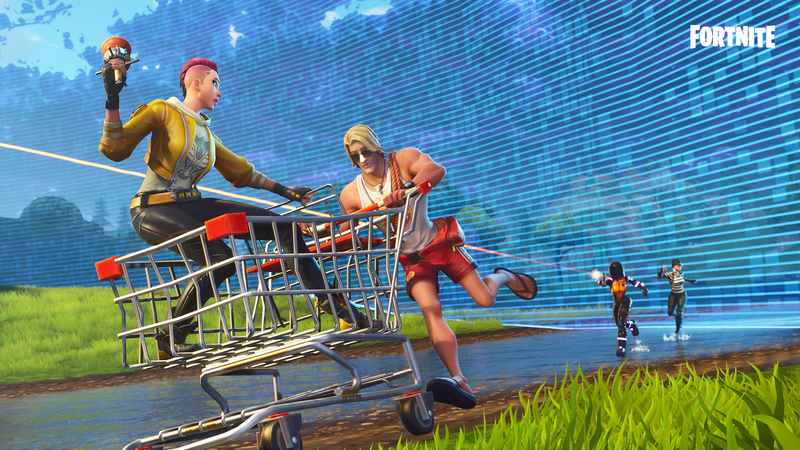 Drop into the Battle Royale map with a squad of friends for an hour. Play on the same team to build together or switch to different teams to fight. Players respawn unless eliminated by the Storm. The Storm doesn't start for 55 minutes and takes 5 minutes to close in. 10 times the amount of resources are gained from harvesting. 100 Llamas will be spawned on the map. Chests & ammo boxes spawn 100% of the time and contain extra ammo. 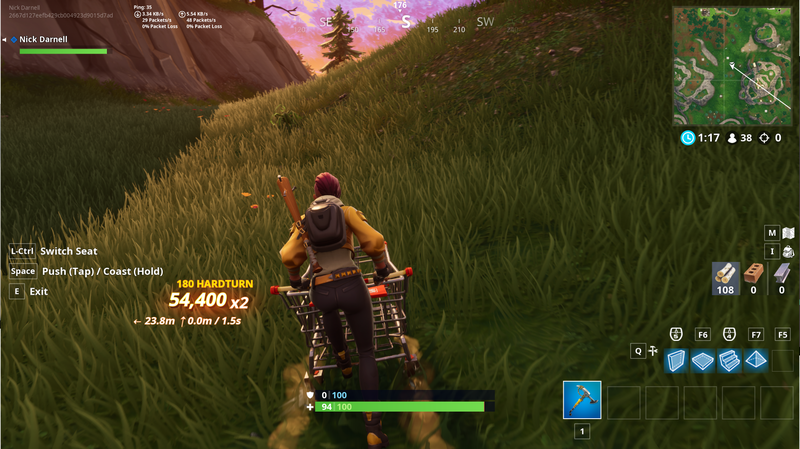 Bust a move with an ATK or Shopping Cart. New functionality has been added to the UI that shows what type of stunt you pulled and the points you earned for landing them. Which tricks will you pull off? Each week during the run of the Road Trip event, there will be a new Weekly Challenge mission in the Challenge the Horde zone. These zones include specially crafted challenges to push player’s skills using a variety of modifiers and wave compositions. First completion: Choose 1 of 3 Legendary Flintlock ranged weapons. Repeatable quest: 75 Roadtrip Tickets. As a thank you for our sticking with us during our Birthday Llama issues we’re giving away three free Birthday Llamas. 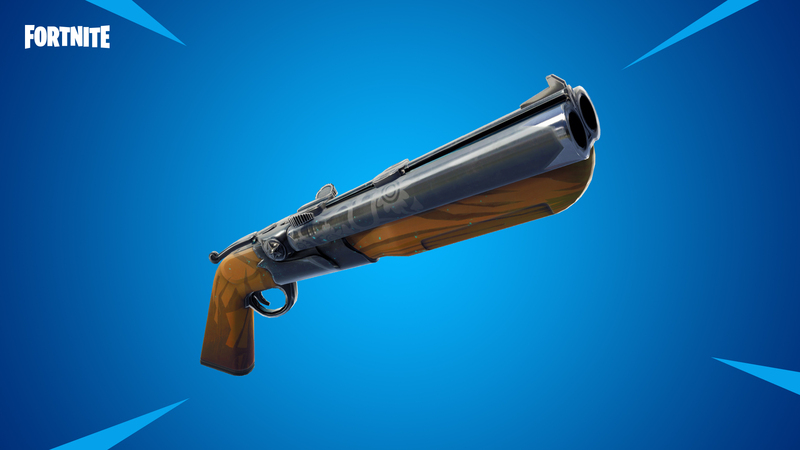 Available in the Loot Tab! A new side quest chain is now available after completing Plankerton: Storm Shield Defense 5. Completing these quests earns you two new Survivors. Destroy the Encampments mission now ends upon all encampments being defeated or the mission timer reaching 0, whichever comes first. Players can complete either a Category 2, Category 3, or Category 4 Fight the Storm mission to complete the Put It Through Its Paces Quest. Discovering Bunkers in the Desert Biome will now give progress for the quest Canny Underground. Mission Control has been added to Fight the Storm, Deliver the Bomb, Repair the Shelter, Evacuate the Shelter, and Launch the Rocket. Now all difficulty increases and mission start will require votes. Voting to start the mission is only required until mission ready timer ends, currently set to 10 minutes. Fixed an issue where rejoin was unavailable after crashing out of a session. Fixed an issue where SEE-bot could not properly activate in Repair the Shelter missions. 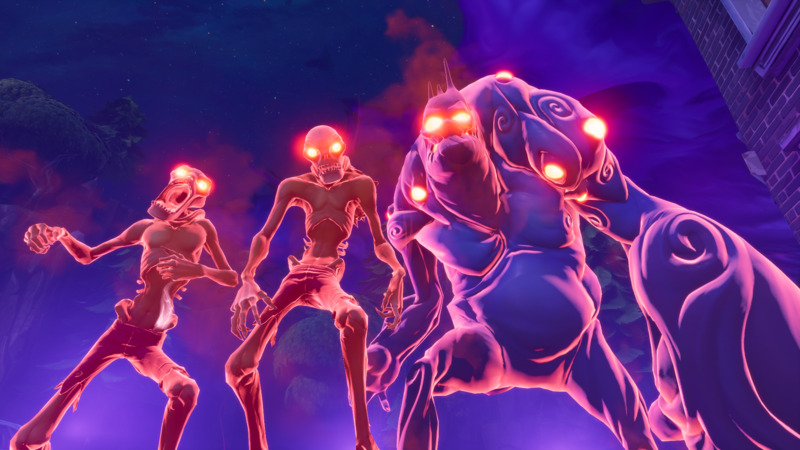 Twine Peaks Storm Shield missions will now spawn Outlander Fragments during the defense. Fixed an issue where some players were unable to complete Founders quests. 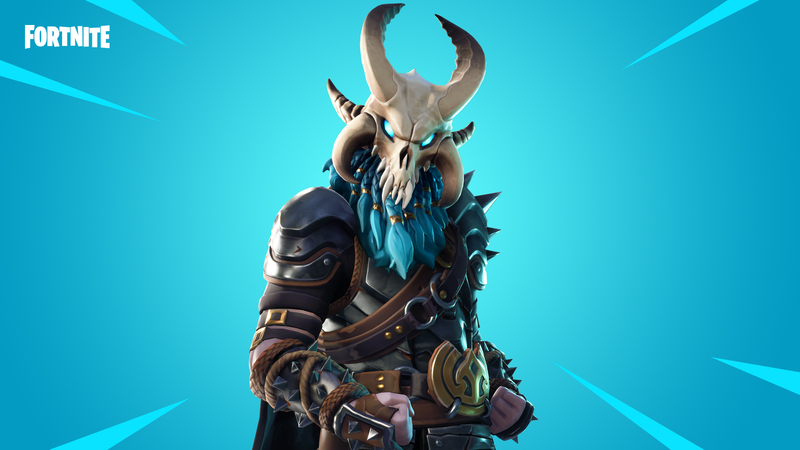 Mythic Ragnarok Outlander comes to the Event Store. Available August 8th, at 8PM ET. Features New Subclass - The Dark Viking. New Ability: Seismic Impact: Punch the ground causing it to rupture knocking back up to medium size enemies and dealing energy damage in a 2 tile line. Fault Line: Seismic Impact’s cooldown is lowered by 6 seconds. Sustained Impact: Seismic Impact’s stamina cost is lowered by 15. Return To Sender: Seismic Impact returns to its original impact location. Fixed an issue where War Cry's Mighty Roar perk would not apply to allies who were obstructed by the environment. Fixed an issue where equipping Goin' Commando caused the players feet to slide. Fixed an issue that caused Rare Centurion Hawk to not increase star level when evolved. Maximum overload now shows the correct damage value in the tooltip. Fixed an issue that caused players to be stuck when Charged Fist is interrupted. Fixed an issue that caused Assassination visual effects to linger after Assassination discharged. Fixed tooltip formatting of Fan of Stars perk in the abilities tab. Improved the reliability of the Walloper’s Leap Attack dealing damage and playing visuals properly. Fixed an issue where the Epic Fishing Hook had stats that were too low. Fixed an issue where Helium Shotgun impact effects would appear in the air near Encampments. Freedom's Herald (and rarity variants) can no longer roll Magazine Size or Fire Rate perks, as this weapon can not hold more than one round. Players searching for Truck Stops in Route 99 should find them more often. Terrain will no longer generate next to each other in Desert and Route 99 biomes, this prevents the pit of doom where players can't build out and are stuck. Various missions that should not have spawned in the Desert sinkhole now won't spawn there. Fixed some animation issues in the Mission Activation panel. Fixed an issue where Deliver the Bomb track distance was too short in Route 99. Fixed a couple of hard to build out of pits in Desert and Route 99 biomes. The fourth player joining a Build a Fort mission no longer spawns underneath the terrain. The Super Shielder now correctly takes damage from those who do not have permission to build/do damage during a Storm Shield Defense. Fixed an issue where multiple Gunslinger enemies would spawn. Fixed an issue where players were unable to rejoin after hard closing the game. Added ability to rebind “J” as a movement key. Added new announcement for when a player is completely out of building materials while they have Auto Material Change enabled. Added a context menu to card buttons of the collection screen. Elemental Storm Zones now show the correct element when the alert window shows. Fixed an issue where multiple section items would remain highlighted in the Collection Book. Fixed an issue where if you rapidly dismissed and then reopened the chat window using a gamepad it would force you into Build Mode. Fixed an issue that caused multiple reward pages to appear in the Collection Book. Fixed split second hover of bottom option in Alterations option list when selecting an alteration to change with a controller. Fixed an issue where the evolution picker would incorrectly choose an evolution when re-entering evolution confirmation screen. Fixed Credits not running to the end. Fixed unexpected sound effects playing in the Mission Activation panel when using a mouse and keyboard. Purchasing multiple free Llamas no longer claims you have 0 v-bucks when you actually have some. Fixed an issue where the vote notification indicator sometimes showed incorrect information. Fixed an issue where the Mission Activation could show an incorrect countdown timer. Fixed an issue where the mouse cursor could disappear if a player clicked on certain parts of the Mission Activation Widget. Fixed small world props rendering at extreme distances. Fixed an issue that could cause menu music to stop playing. Fixed an issue that could cause campfire sound effects to overlap each other.